Hi! I’m Heather, and I am excited to show you a little bit of Oklahoma City (OKC) because I think it’s awesome. I have lived here for most of life and today it’s the best I’ve ever seen it – and it will be even better tomorrow! That’s how fast it’s changing. I can’t wait to tell you about Oklahoma City’s $8 lake-side camping, our gorgeous, free botanical gardens and our amazing $3.50 tacos! OKC is home to three lakes: Overholser, Hefner, and Stanley Draper, plus a fourth, Arcadia, in the suburb of Edmond. All four offer recreational activities, but only Stanley Draper and Arcadia offer campsites. Camping at Arcadia starts at $10. Camping at Stanley Draper is $8. OKC rooms on AirBnB begin at $30, and we have no hostels. If you’re willing to drive out to Norman (about 30-45 minutes from OKC on the highway) you could try staying at a cozy-looking farm. The outside portion of the Oklahoma City National Memorial is free and it’s very pretty at night. The outside includes digital displays, the foundations of the Murrah building, the chairs, the plaza, the playground, the reflecting pool, and Survivor Tree. 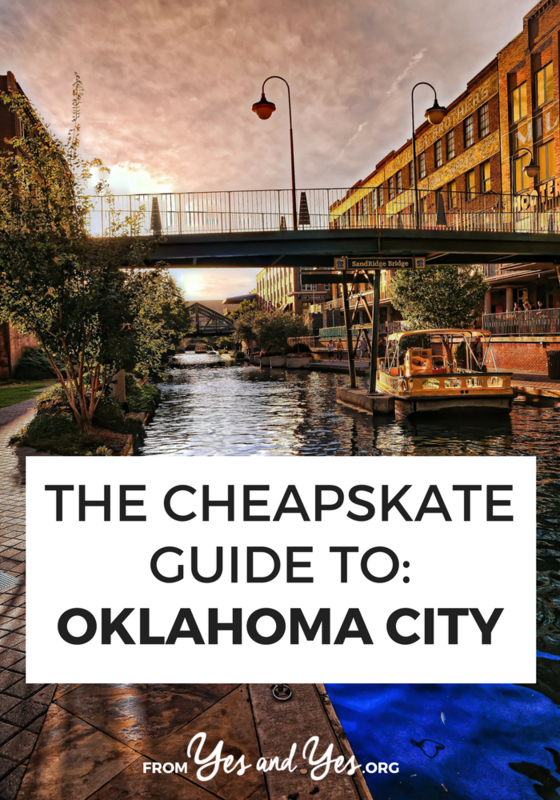 Bricktown is an interesting walk and good for people watching, but it is a bit over-crowded and a little bit expensive. However, if you follow the Bricktown canal to the south you will see the Land Run Monument. This is a life-size reenactment in bronze of the 1889 land run; 45 statues, very detailed and dynamic, and one of the largest bronze monuments in the world. My favorite cheap fun is a visit to the Myriad Botanical Gardens. You can keep it a free visit by moseying the outdoor gardens and water features, walking the bridges, and watching the geese and giant koi in the fishpond. If you want to pay the $8 admission, you can go inside the tropical conservatory. The botanical gardens also have affordable community activities on a daily basis; everything from gardening and exercises classes to movie nights and concerts. Many of these will be free, and most will be $10 or less. If you are at the gardens on a weekend or evening, there will probably be something going on. OKC has lots of street festivals! Each street festival (or “block party”) is a little bit different, but they are all free to attend and you are likely to find any of the following: concerts, street performers, food trucks, special festival-only discounts at neighboring businesses, free street games (such as bean toss or giant jenga), and good people-watching. OKC has a large 20s-30s demographic and they love to party, thus, street festivals happen on the regular. There is Midweek in MidTown every Wednesday, and Tuesdays in Deep Deuce. Automobile Alley, the Plaza, the Paseo, and Film Row all have monthly events. You probably know about the Thunder (you can get balcony tickets in Loud City for $15), but you may not know that we also have a professional soccer team (tickets start at $10). Then there’s my favorite, the OKC Dodgers, our AAA baseball team. They were first in the league last year, the ballpark is romantic, you can eat a real Dodger dog, and tickets start at $10. You can also visit the Boathouse District, where you can admire the modern architecture of our new boathouses (the Olympic teams train here!) and watch world-class rowers zoom along the river. At the end of the day, consider catching some of the city’s best sunset views at Lake Hefner, and on a good day you can watch sailboats, kite boarders, and kite fliers. Can you imagine how far you can see when you’re 50 stories high in the Great Plains? At the top of the Devon Tower is a very fancy restaurant called Vast, and associated with Vast is the Lounge. The Lounge is cheaper and less formal. You can head up there (using free valet parking), order fancy potato chips or a drink, and enjoy the view. Since it’s that time of year, I MUST tell you about Downtown in December! Every year there are a host of fun holiday activities (just follow the link). My favorite freebie is narrated water taxi rides in Bricktown (Thurs-Sun evenings). Bring your coat and be prepared to wait in line; the canal is lovely when lit with holiday lights. I never miss the lights on Broadway, from about 5th to 10th St. The buildings are covered in color, and I mean it. Outdoor ice skating at the Myriad Gardens is only $8 if you bring skates ($12 if you rent), and there are usually freebie nights in the Crystal Bridge Tropical Conservatory, complete with lights, carols, and hot cocoa. In general, hot dogs are you cheapest go-to. If you are downtown, you can try the OKC mainstay, Coney Island. Coney Island opened downtown in 1924, and you can still get hot dogs there for $1.50. I also enjoy the $2.79 chili cheese dogs from Chili Dog Express (where you will also get big smiles, and sometimes meet a man dressed in a hot dog costume). There’s also Mutt’s Amazing Hot Dogs. Mutt’s costs a bit more ($4-8), but also has exotic and vegetarian options. Your next best bet for cheap food is tacos from just about anywhere. Big Truck Tacos (both a truck and a brick and mortar) is the local heavyweight with breakfast and lunch tacos in the $2-4 range. For a little thrill, you can order the 5th Amendment taco for $3.50 – they won’t tell you what’s in it, and it changes daily. OKC is gonzo for food trucks. My favorite truck is the Loaded Bowl, with filling vegan food good enough to delight carnivores. You can get a full bowl for about 8$, or get any menu item as a side for $3. I usually order two “sides” so I can try two dishes, and it’s cheaper! You can easily catch food trucks at a street festival, Facebook, or on evenings and weekends at the Bleu Garten Food Truck Park. I would be remiss if I didn’t mention my favorite happy hour at S&B Burgers. They have four OKC locations and loads of different burgers (my favorite is the Black and Bleu: also, they have veggie burger patties). Sliders and appetizers are $3 from 2-6 every weekday, along with daily specials. It’s only $1.25, and it tastes like a marshmallow and some ice cream had a baby. Baked fresh, from scratch, every day. My favorite is the Boom Boom Pow, but my husband prefers the Vanilla Sky and my bestie goes nuts for the Traveler. All wrapped up in a cozy bungalow. If you visit Bricktown, why not stop in for a cup of happy? Ok, so fancy coffee isn’t exactly cheap-o, but if you like coffee, trust me. You want this local roast. (You can kill two birds with one stone if you order an Elemental coffee at Cuppies and Joe). If downtown is out of your way, I also adore the drive-up coffee stand, Leaf and Bean (who use Tulsa-based Mariposa roasters). I hope you have a chance to come and visit our city sometime… and I hope you enjoy it as much as I do! Thanks so much for sharing, Heather! Oklahomans! What did we miss? Tell us in the comments! I second Big Truck Tacos, The Bridge at night, and Cupies and Joes. Love this post! I’ve been meaning to make a visit up there as it’s only a short Amtrak ride north from Dallas (okay, Fort Worth). Am bookmarking for all the great food recommendations! This is brilliant! I’ll be over for a wedding (my brother’s) next year, and I was thinking of hanging around for a while. This is going straight in my bookmarks. There are so many fun things to do there! Also check out Andkathleen’s blog and Instagram, she lives in OKC and is always posting about cool things to do/eat/see! What is your contact info and I will add you to our press list? Don’t forget Mt. Scott and Medicine Park. If you can rent a car it’s an hour and half away. Mt Scott has one of the largest free-roaming buffalo herds as well as longhorn cattle. You can take a windy road to the top of Mt Scott and enjoy a beautiful view of the plains. Large boulders for bouldering also. Medicine Park is a tiny village of stone houses that originally was a weekend getaway for OKC folk at the turn of the century. The WPA built stone ledges just under water level to sit on and be cooled in the creek. $2 fee. The village also has a cute old one lane bridge with wooden panels to cross the creek from one side to the other. Art galleries and restaurants are there to fill out the day.